The Filipino as a race with distinct identity and multifaceted yet distinguished culture has always been esteemed and loved by other countries. But as a nation which follows modernization and progression, it is only expected that changes and development may occur in the process. It is then only vital to “re-vision” that identity to keep track of who the Filipinos are – yesterday, today and tomorrow. Ang KaSaMa (Ang Katipunan ng mga Samahang Maharlika) Inc. together with Alumni, Friends and Benefactors of the Asian Center, Inc., (AFBAC – UP Diliman) and Humanistic Studies 20 Class (Mito at Alamat sa Pilipinas) of the Department of Arts and Communication, College of Arts and Sciences in UP Manila brings “Maharlika Summit 2014: A Conference-Festival Summit on Maharlika – Re-visioning Maharlika as Cultural Metaphor, Folk History and Social Movement for National Identity, Transformation and Development” on February 22, 2014 at GT-Toyota Auditorium, Asian Center, UP Diliman Campus, Quezon City. 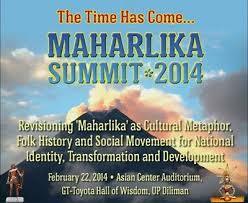 In the context of the summit where “Maharlika” refers to the based groups in the country including the Filipino groups abroad, the event aims re-visits the nation’s heritage and deep-rooted culture based on ideals, theories and studies from the academe as well as from the viewpoints of representatives of the variety of groups. The conference will include academe presentations, panel discussions, sharing, and workshops and cultural entertainment presentations, among others. This whole day event is open to concerned and nation-loving individual and groups who are willing to partake in this nationalistic effort. If interested, please direct queries to Ms. Aimee Villas Adalla via email address avadalla@west.com or visit http://maharlikasummit.com.